It is always hard to put into words our feelings when someone passes, even more so when that someone has had a great impact on your life. So it should be no surprise that adequate words escape us at this time. 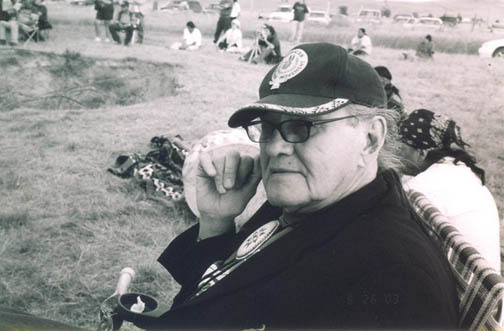 Vernon Bellecourt, a long time friend and supporter of the Oglala Commemoration has passed. Yet these words are not nearly enough to convey what Vernon really was...to me and my family, he was a friend, an uncle/grandfather, an inspiration, a mentor, a guiding light in troubled times...this, and so much more. As I have seen so many others write recently, Vernon was truly an inspiration to Native people everywhere. His strength and courage was infectious...you could feel the power of his words as he spoke about issues facing Native peoples...especially as he spoke them in the proverbial "Lions' Den". Outside of Jacob's Field in Cleveland, he steadfastly conveyed the message that using Native people as mascots continues to dehumanize and objectify us, even as drunken fans dressed in chicken feathers hurled insults (or empty beer bottles), trying not to hear the truth of his message. In the dignified halls of academia, he took universities to task regarding the perpetuation of stereotypes and the continued desecration of sacred sites and Native remains, while administrators and professors tried to rationalize their actions. 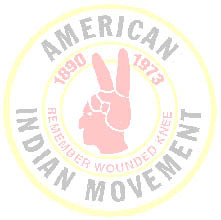 However, these rationalizations ultimately failed, as happened at the Ohio State University on more than one occasion when administrators could produce no good reason why the institution still held the remains of thousands of Native people or why they continued to support projects such as Mount Graham. But even more important than tackling these issues head-on, was the effect that Vernon had on Native youth. His strength and his voice was an example to Native youth everywhere. Through his words and actions, many of our young warriors found inspiration. I have seen it with my own children as well as many of my former students. Through his example, they have found their own voice and the strength to stand up for what they believe. Vernon was always excited to meet with the youth. In them he saw the future—a future that he and many other contemporary warriors had struggled for and sacrificed so much to achieve. He hoped that through these youth, the long fought struggles for equality and justice would finally come to fruition. Vernon saw the promise of a bright future in these youth and it was his dream that they would pick up the torch and carry on in the struggle. Vernon's legacy will live on in the hearts and minds of the youth that he so greatly impacted. Vernon's support of Leonard Peltier and the Oglala Commemoration Committee has been unwavering, and his belief in our mission and message has always been a source of strength for us, particularly in those times in which the road gets hard. . Vernon Bellecourt will be sorely missed and our hearts will ache, but his strength, his words, and his actions will live on in the thousands he has inspired over the years...and I guess in the end that is what those who oppose the work of the American Indian Movement fear most. As words are hard to come by, it was an honor to have met Vernon. His legacy will live on through all the lives he has touched. His voice, his strength will sorely be missed.